When we travel, I’m used to having my beauty and skincare take up some serious weight in my suitcase. It’s so much so that the Clint and Jackson share a suitcase, Dylan has his own (which is a small carry-on so we can take pull-ups on the plane) and then I have a giant bag all to myself. Plus, I’m a notorious overpacked, so I need the space. On this past trip to Disney I wanted to actually try and travel with some smaller sized skincare to help out with weight and space in my bag. I posted on Instagram that I was looking at this Beautycounter set and I got some responses from ladies who said it was great, so I gave it a try. 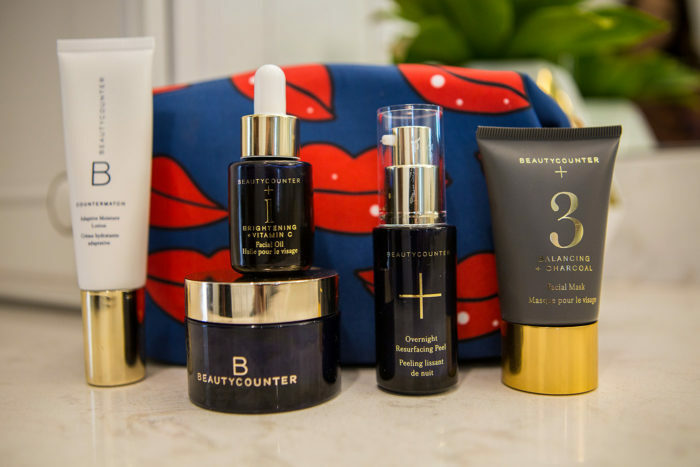 I had already tried a couple Beautycounter products (see here and here) and liked them, so I figured it was a good time to try some more! The best thing about this set is that all I needed to add was my eye cream and a sunscreen, and I was all set for the trip. I liked most of the set very well, but three of the products stood out to me as favorites. Cleansing Balm // I already love the Colleen Rothschild Cleansing Balm, so I was happy to have another one to try, as well. I think, to compare, the Beautycounter balm is lighter and not quite as hydrating. This made it great for Florida weather, but I think it would be a good one for daytime or for summer. I’m certainly not giving up my CR Cleansing Balm, but it’s good to have options! Charcoal Mask // I love a mask these days and I really liked this one! I love how it dried on my face and that I could see the gunk being pulled out from my pores (sorry, it’s gross but oddly satisfying to see!). After sunscreen and sweaty days at Disney, it was a great addition to have in my skincare kit. Overnight Resurfacing Peel // People have been RAVING over this one all over social media, so I was excited to try it. It’s a gentle peel that you put on after you cleanse. Then you let it dry for a few minutes and top with your moisturizer. I’ll be damned if it didn’t actually make my skin feel brighter and clearer the next morning. I did this on alternating days with the Charcoal Mask and the glow was SO good. The other two products, the Vitamin C Brightening Oil and the Adaptive Moisturizer were also good products but didn’t wow me like those three did. The oil definitely felt nice and it was hydrating and added a glow to my skin. I’m interested to see how it compares to the BeautyBio Radiance Face Oil I just ordered. When it comes to moisturizer, I’m super picky and haven’t really found a daytime product that I love. I still very highly recommend and love the Tata Harper Creme Riche for nighttime and don’t plan on giving that one up anytime soon – it’s the absolute best! Have you tried any of these products? Which have you liked/not liked? Any other favorites?